That is all from another manic weekend of European football. Drubbings, sending-offs, bizarre own goals, shock results and managerial speculation. Thanks for your company and see you soon. Night. How tight is that for the bottom of La Liga right now? Real Sociedad move up to 15th but level on points with 19th-placed Levante. Moyes or Mel for Real Sociedad? The Guardian are reporting Real Sociedad president Jokin Aperribay has said a decision over the club's new manager could be taken on Monday and said the two candidates are David Moyes and the former West Bromwich Albion coach Pepe Mel. They report Aperribay has been quoted on Spanish TV channel Canal Plus. So Moyes or Mel? Which one would you want? As you can see from the stats, PSG just about shaded it. What a huge win that is for PSG in Fance as well. Defeat to Marseille would have left them seven points adrift of the leaders, now there is just the one point between them. It would take a brave man to bet against the Ligue 1 champions from defending their title from here. Yes Diego, so you should be looking down. It was a miserable night for Atletico Madrid as they were well and truly second best against a brave Real Sociedad. That's all folks. Unbeaten PSG close the gap on Ligue 1 leaders Marseille to one point. Oooh. Very nearly a crowning moment for Zlatan Ibrahimovic on his return. The big Swede jinks this way and that to work space for a shot but his left-footed effort lacks power and is easy for Mandanda to save. We are into stoppage-time and Marseille coach Bielsa is crouching on the touchline like a man in some discomfort. His team's lead at the top is about to be cut to a single point. What a result for Real Sociedad. If David Moyes is about to be appointed their manager - which the Spanish press are strongly suggesting - then he will be taking over a side with real spirit. Last few seconds here. Surely a second defeat of the season in the league for Atletico? Zlatan beats his man in midfield and slots a lovely pass out to Serge Aurier. His whipped cross is perfectly judged and Edinson Cavani heads home. Game over? Looks that way. Time is running out Atletico as they look set to lose ground on leaders Real Madrid in the race for the La Liga title. How big a win could this be for Sociedad though? A second win of the season would move them out of the drop zone. Four minutes of injury time signalled. Is this Zlatan's moment? The ball is crossed over to the Swedish striker and he attempts an outrageous flying volley. In the event, he comes closer to making contact with Mendy's head as the left back gets back in the nick of time. The Italians move three points adrift of leaders Juventus with a convincing home win. No playing for time for Atletico now as Antoine Griezmann is introduced from the substitutes bench. Can the France international rescue a point for the champions. Four minutes on the clock. It's a red card, and Marseille are down to 10 men. The more I see this, the harsher it gets. Imbula runs with the ball through midfield, overuns it slightly and competes for a 50-50 with Cabaye. There's no obvious foul - if anything Cabaye's foot goes over the ball - but it is the PSG man who hits the ground holding his ankle and Imbula is shown a straight red card. This is now a huge ask for Marseille. Atletico Madrid's spoiling tactics get what they deserve as Sociedad take the lead. A brilliant header from Imanol Agirretxe beats goalkeeper Miguel Moya from Joseba Zaldua's left-wing cross. This is pretty ugly by Atletico. At every opportunity, they are bringing down their opponents, slowing up play and basically just taking as long about things as possible. Seven Atletico players booked and one sent off. It hasn't been a classic on their behalf,. Extraordinary effort from Mendy as he fires off a first-time volley from the left flank that almost catches PSG keeper Salvatore Sirigu by surprise by lands just the wrong side of the post from the visitors' point of view. Atletico boss Diego Simeone glances the ball away with his head on the touchline. The home fans give him the bird, accusing the Argentine of playing for time. He probably is as well. Real Sociedad are still biting into every challenge and coming out on top. Not often you can say Atletico have been out fought but they have been this evening. Fifteen minutes remaining. Wow, Cabaye's first touch almost brings a goal as he unleashes a powerful drive, which Mandanda pushes aside. Cavani makes a mess of the rebound, scooping it over the bar when Zlatan was free in the middle. The big man is back. 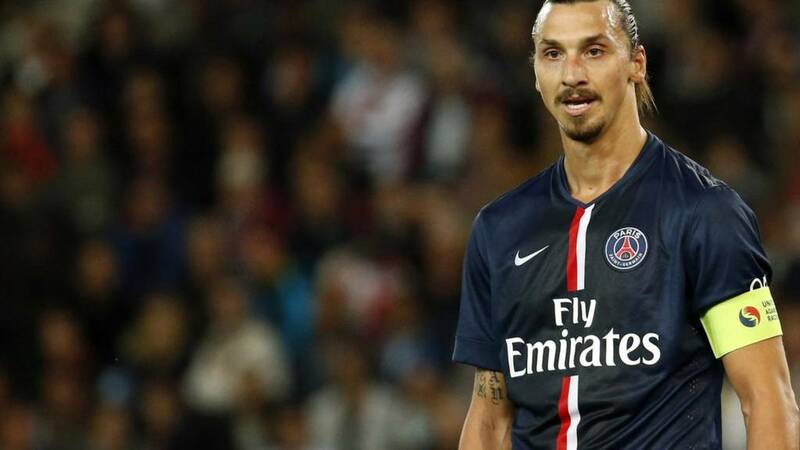 Zlatan Ibrahimovic is coming on for Lavezzi and the Parisian fans are delighted. Yohan Cabaye is also on for PSG. You have to say the way this match is going that Atletico would be happy to scarper with a point. Under heavy pressure, down to 10 men and 20 minutes still remaining. This is where champions show what they are they made of. PSG are pressing hard for a second. This time the ball sits up nicely for Pastore, but he drags his shot wide of the near post. Still no changes by either manager. Tom Miszkowski: Second half has started at the same pace as the first was played at, competitive, full blooded, 100mph, more of the same pls, PSGVOM. Another loud shout for a penalty by Sociedad and again they are probably hard done by. Carlos Martinez's right wing cross is blocked by the arm of Cristian Ansaldi but the ref waves play on. It looked like the defender moved his arm into the ball though. This game is opening up big time, with Lucas Moura right in the thick of things. PSG fashion a couple of half chances, much to the approval of Zlatan Ibrahimovic, who is now warming up on the sidelines. Mario Mandzukic should be celebrating his second goal. Cristian Ansaldi pulls the ball back to the striker 10 yards out from goal but his swing of the left boot sends the ball wide. Should score. Pinball in the PSG box. David Luiz's air-kick presents Gignac with an opportunity, but the France striker is surprised by the ball and it bounces off his instep. Moments later, more sloppy defending gives Gignac another opening, but he opts for a chip and it's a powderpuff effort. I would surprised if we don't see another red card before this match is up. Both sets of players are throwing themselves into challenges and, with a lot of theatrics on show as well, this is bubbling up nicely. We're underway again in Paris and there's another injury worry for Marseille. This time it's Mario Lemina who is writhing around on the turf, but he responds well to treatment and we're on the go again. No sign of Zlatan ... yet. Atletico Madrid are furious as Guilherme Siqueira receives a second yellow card and gets his marching orders. There can be few complaints though as his challenge was late and he misses the ball. The visitors can argue all they want - and they will - but the ref got that right. This match is tasty. I've just seen a replay of some handbags in Parc des Princes, which I missed at the time. It was Gignac and Cavani and they came so close they practically kissed. This is easy street for Roma as Serbian midfielder Adem Ljajic deftly curls into the top corner from 20 yards for the hosts's third goal. Leaders Juventus scored seven earlier today, how many can Roma score? Can Sociedad keep up the tempo they played with in the first half? If they can, Atletico could be in trouble. Game on. Lucas Moura's sixth league goal of the season is the difference between the teams at half-time in Le Classique. Atletico Madrid may have dominated possession but it has been the hosts who have looked the more dangerous. Can they keep it going? A stirring half from Real Sociedad but surely they will be disappointed they aren't ahead? Atletico Madrid can play better and you can't help but feel they probably will after the break. We have a major injury concern for Marseille now as top scorer Gignac goes down after appearing to twist his knee on the turf. The magic spray seems to do the trick, however, and it looks like he'll be ok to continue for now. Atletico's Diego Godin rises above everyone, like the proverbial salmon, but heads over the bar with goalkeeper Enaut Zubikarai flapping. Cracking goal from the hosts to ignite Le Classique. Thiago Silva breaks from the back and pings a pass to Lavezzi on the left. He exchanges passes with Cavani and gets in behind before slotting a low cross which Lucas Moura taps in. Replays suggest Marseille defender Mendy kicked the ball onto Moura's toe, but it's a goal either way. Real Sociedad have Atletico on the ropes as Carlos Martinez's whipped in free kick is well parried away by the busy Miguel Moya. Atletico aren't the types to throw in the white towel though. Atletico Madrid's Diego Godin does brilliantly to clear off the line but Sociedad should be ahead. Imanol Agirretxe is played clean through on goal by Miranda's horrendous back pass. The striker takes the ball past the stranded goalkeeper Miguel Angel Moya but, as he rolls the ball weakly towards the empty net, Godin brilliantly slides in and hacks the ball clear. Good defending but he must score. Romain Alessandrini is the latest to test out Sirigu, drawing a sharp diving save from the PSG keeper with a low fizzer from distance. Roma are well on the way to closing the gap to Serie A leaders Juventus to three points with a commanding first half. Francesco Totti has been imperious. PSG look very ropey at the back. Thiago Silva is robbed of the ball by Gignac, who squares for Payet. His shot has power but no direction. Is this the same Real Sociedad who are second from bottom in La Liga with just one league win this season? The league strugglers are all over the defending champions like a rash and at the moment look the more threatening. Great chance for PSG. A corner finds its way through to Javier Pastore via Lucas Moura's back-heel and his low left-footed effort is pushed away by Steve Mandanda in the Marseille goal. Drama at Sociedad. Diego Godin momentarily thinks he has conceded a penalty when the whistle blows as Carlos Vela tumbles in the area under his sliding challenge. No spot-kick is given though and instead the former Arsenal man is booked for diving. What a let-off for Atletico as that was never a dive. Godin missed the ball, got Vela and he should have been punished. PSG are getting into the game a bit more now, without offering much threat to the Marseille goal. There's a wall of sound from the stands, and on the touchlines the two managers are in their trademark poses. Laurent Blanc, all in black, is on his feet right on the edge of the pitch. Marcelo Bielsa, in an old-school blue tracksuit, is seated on a cool box as he studies the play. L Higgins: Marseille's movement on and off the ball has been impressive. What a response. Former Arsenal midfielder Carlos Vela bends in an equaliser from 25 yards for Sociedad. David Moyes would have liked that if he was watching. The hosts have matched Atletico in the opening 16 minutes and deserve that. Seydou Keita doubles Roma's lead with a low strike from 18 yards. This is looking easy for the hosts. This is an awesome start from Marseille and they come so close to scoring again as Alessandrini cuts across his marker to meet a cross from Mendy and hooks an effort that shaves the outside of the post. That is a great team goal by Atletico. Juanfran works the ball to Raul Garcia and his bending pass in behind Sociedad's defence is buried by Mario Mandzukic. Just the start Diego Simeone was looking for. So close from Marseille. Andre-Pierre Gignac sprints to the near post to meet a corner but his header thunders back off the woodwork. Dimitri Payet follows up, but his shot is too high. If David Moyes is at Real Sociedad this evening, he is doing a good job of keeping himself hidden. What do you reckon? Fake beard, false moustache, pair of glasses? The press in Spain are still expecting the former Manchester United boss to be appointed as coach imminently. Roma almost double their lead as Miralem Pjanic curls a 20-yard free kick against the bar. Great effort. Toniwater: Sir Bobby Robson won trophies with Porto, PSV & a treble with Barca! A gentleman & a winner abroad! Who are your favourite past and present British exports in European football? And, slightly belatedly, we are off in the French capital. Pyrotechnics and pop music greet the arrival of France's top two teams onto the pitch at Parc des Princes. This feels big. However, their last eight games have produced just three draws, the most recent of them a fortnight ago at bottom-of-the-table Cordoba. Last weekend's 2-1 win over Lens ended a run of two straight losses for Marseille as they sit top of the pile in Ligue 1. Their striker Andre-Pierre Gignac is Ligue 1's joint top-scorer with 10 goals but has not netted in his last three outings. Having lost their last five matches against PSG, Marseille could do with him ending his scoring drought this evening. A great start for Roma as Greece defender Vasilis Torosidis volleys home at the near post from Francesco Totti's cross. Are they on their way to returning to winning ways? No prizes for guessing what Ibrahimovic's favourite goal for Sweden was. Yes, that ridiculous 30-yard overhead kick against England in Novermber 2012. You can watch it again here if you want. Underway in the Stadio Olimpicio where Roma are looking to close the gap to leaders Juventus to three points. We are asking who is your favourite British export in European football, past or present? Abz Mulla: Gareth Bale made an immediate impact in Spain with that magnificent 50 yard solo against Barcelona. Still gives me goosebumps. Dean: Has to be Vinny Samways. What a legend of Spanish football. John McEnerney: Steve McManaman won trophies, the respect of his teammates, the fans & the media! Made his life easier by learning the lingo! Has anyone missed Zlatan? Yep, me too. The mercurial Sweden striker has been missing from Paris St-Germain's side since 21 September with a heel injury but tonight marks his long-awaited return as he is named on the bench. His return is more than timely too as the champions currently sit four points behind leaders - and tonight's visitors - Marseille. They may be unbeaten in Ligue 1 but, with six draws from their 12 league matches, they need to improve. Real Sociedad: Zubikarai, C.Martinez, Mikel, Bergara, Inigo, Granero, Agirretxe, Prieto, Vela, Chory Castro, Yuri. Atletico Madrid: Moya; Juanfran, Miranda, Godin, Siqueira; Mario, Gabi, Koke, Arda; R. Garcia, Mandzukic. Sociedad shouldn't be expecting any freebies tonight either. Defending champions Atletico may have lost Diego Costa and Thibaut Courtois to Chelsea in the summer but they show no signs of dropping off the title pace any time soon. Diego Simeone's men would move to within a point of leaders Real Madrid with victory and, having lost just once all season, it is difficult to see them slipping up. A run of eight wins and just one defeat in their last nine games in all competitions shows they mean business. Real Sociedad could certainly do with a boost as they loiter second from bottom in La Liga. Whether David Moyes would provide that is a matter of opinion but, with just one win from their first 10 league games, the only way is up. Be warned though David, with 15 managers in the last 14 years, the job would appear anything but stable. With all the chat coming from Spain about David Moyes's return to management in Italy, we thought we would ask you about your favourite British exports. It can be a player or a manager but tell us which Brits really made an impression when they moved abroad in football. Don't just give us a name, let us know why you have chosen them. In Germany earlier today, there was a contender for the own goal of the decade as Borussia Dortmund climbed off the foot of the table. It ended a five-match losing streak for last season's runner up and, if you can, watch the own goal. It really is incredible. Roma: De Sanctis; Torosidis, Manolas, Mapou, Cole; Pjanic, De Rossi, Keita; Gervinho, Totti, Ljajic. Subs. Torino: Gillet; Maksimovic, Glik, Moretti; Bruno Peres, Gazzi, Vives, Farnerud, Darmian; El Kaddouri; Quagliarella. Roma will be desperate to get things back on track when Torino visit the Stadio Olimpico this evening. The Giallorossi have lost their last two matches, to Napoli in Serie A and Bayern Munich in the Champions League, and fell six points behind leaders Juventus earlier today. 7-0 drubbing of Parma, now it's time for Roma to show us what they are made of. We won't just be stopping in Spain this evening though, with attractive trips to France and Italy also in the offing. The top of the table clash between Paris St-Germain and Marseille will be very much on our radar as will Roma's home match against Torino in Serie A. So, six teams, three different countries plus the potential return of a former Manchester United boss - stay tuned, this could be a busy one. Yes, if the Spanish newspapers are to be believed, David Moyes will be appointed Real Sociedad boss after their home La Liga match against Atletico Madrid this evening. AS reports: "David Moyes is to be named the new coach of Real Sociedad. The Scottish coach, 51, has already said yes to the offer made by the club's president Jokin Aperribay and barring any hitches in negotiations he will be announced as first team coach on Sunday." Just seven months after getting the boot from United, is 'Moyesey' about to return to the game? We will let you know of any sightings of him at the Anoeta Stadium this evening during our live text commentary of the match. Could this become Moyes watch? The return of the Moyes? Well, after seven months perfecting his golf swing, David Moyes could be set to take the driving seat once more.